Some of these illustrate that everything has to be in order. Other comparisons might be the total picture with all its parts, like a checkerboard. Someone once told me that there is madness in your method, but it splits the whole job of gardening up in small parts. And I like to think in my mind that each square foot is really a separate garden all by itself. It has a border around it, so it has limits. I know immediately how much I can plant in just that one square, for any one plant. That limits my plantings at one time so I don’t have to harvest more than 16 radishes all at once. It also allows me to decide where the taller plants should be and where I want flowers planted that will cascade over the side. It also makes the job of final harvest of one square foot so simple and common sense–you just harvest, mix in one trowelfull of additional compost and you are ready to replant. But because of the season, you are going to replant with a different type of crop from cool weather to warm weather. Without even thinking or studying or having a degree in horticulture, I’ve just done crop rotation. The soil and plants will say thank you. 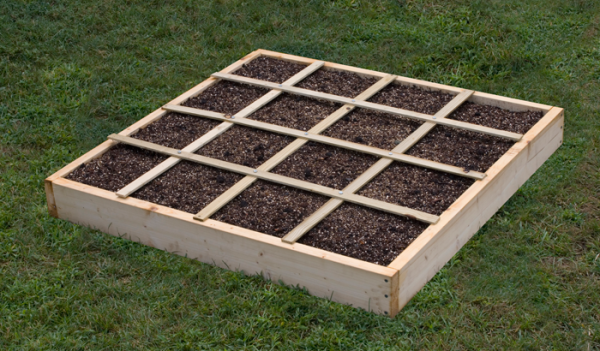 One of the best examples I could give you is a story a lady told me who had some young mormon guests for dinner and they looked out her dining room window and said, “Oh you have a Square Foot Garden’ She asked how they knew that and they immediately said, “Because of the grids. And it’s something we learned at BYU before we went on our mission overseas.” That led me to make up the joke that when you have company and they look out your window and see a regular row garden, the most they are going to say is “That’s nice, but what’s for dinner?” If they looked out and saw a grided square foot garden, they would probably remark, “That’s very interesting. What is that and what do you have planted there?” I’m sure all of you that follow the system to a “T” know many more advantages. And these are the things I want you to pass onto others. Because a Square Foot Garden without a grid is like….taking a trip without a map. So keep those comparisons coming! I like the “parking lot without lines” even better than my original suggestion. This time of the year, when I park at work in the morning the lines frequently are hidden by snow and by the time I leave the snow is gone. It looks “good enough” in the morning, but in the afternoon you can see how much space goes to waste by not having the lines to guide people. The “chess game without a board” is also good in indicating how much more mental effort is required. I have been a SFG’er since the PBS series debuted in the early 1980’s. I have not been using the grids in the last couple of years. Due to semi-retirement, I am going nuts this year. I am expanding our SFG footprint from 250 and change SF to almost 500. I am using all kinds of aesthetically different designs, such as circles, a parallelogram that looks like Tennessee with plants placed where the major cities are on the map, and what looks like the ridiculous row garden (50 feet by 2) that is really just 100 squares. I have made impressions in the soil with yardsticks, which creates a quasi grid and placed tongue depressors in the middle of each square with the name & amount of the crop that goes in that square. Once the crop is planted, you can clearly see the division in the squares. My qualm is that I do not like the look of wood slats or string on my soil. Soil is beautiful, and my plants are beautiful. Additionally, my mulch would hide the grids. To me, the mix, not walking on the growing medium, and knowing how many plants per square are what makes this method the best way to go. You know that when you see green and gold uniforms on an NFL field that you are watching the Green Bay Packers. Likewise, when you see the grids and 16 squares, you are looking at the uniform of the SFG. But, even blue practice jerseys, the Packers are still the Packers. To Howell, from Tennessee. You say you have not been using the grids in the last couple of years. Uh oh, trouble in river city. Well, you seem to be doing everything else alright. So, let me just say this, Howell – you’re missing an opportunity to be a great spokesperson for the SFG foundation because people won’t be able to recognize, certainly from a distance, that you’ve got a square foot garden. Actually, they are going to be so intrigued with all your other designs – that really sounds great. You’ve got to send us some picture of that. I want to share that we everyone. You mentioned you use yardsticks to make an impression in the soil; when we first started taking our square yard into the school yard program we actually used yardsticks for our grid. We had them made and had square foot gardening printed on them, holes drilled, and little pins so the kids could put them together and it really looked quite unique. I hope you are going to enter our photo contest this summer, Howell, but I have to tell you ahead of time one of the requirements is it has to have a visible permanent grid. How about this for a compromise for someone who has been around so long and with SFG: pick out some of your new boxes and add a grid. Let’s find something that you do like. You can have painted grids, different colors, or all white – white really stands out. Or you could get something that looks more earthy that would suit your taste. And then you could show people: Here’s my version of SFG and here’s the official version! How about newcomers: will they follow the no grid and then they’ll deviate from the method or will they still stick to it and be able to visualize and see the different squares? It’s very important otherwise they lose sight of all the advantages of square foot gardening. Particularly the one that says, “hey, today I’m only going to do one square!” I go out and look at one square foot – I’ll either trim it up or harvest it or replant it and that’s all I have to do…I can do that. I can replant it but of course once that’s done it only took a minute or two then I think I could do a couple more…. So it’s an easy way to tackle your garden. And it’s a good way to keep in tune with it too, and up to date with nature. You certainly seem very systematic with your tongue depressors in the middle of each square. I’m glad you mentioned the old PBS series: yep, that was from ‘80 – ‘85 on PBS and then I retired again, but it went back on the air from ‘89 – ‘91 on the Discovery Network and then the Learning Channel. So it had 5 years on PBS and 3 years on the other two channels. We’re still working on all those old shows – we have 74 of them and we’re dressing them up a little bit and bringing some of them up to date and we will issue them in our store so if you go to http://www.squarefootgardening.com and go to the video section you’ll see when those are ready and you can either download those or get a disc of each show. Thanks again for your letter – I’m looking forward to those pictures. I don’t know if you have seen this product yet, but I came across it by accident today and thought it was worth sharing. Thanks for letting us know about this. It looks like a good product and suspiciously very square foot gardenish…if that’s a word. I was not aware of this product, but we are investigating it to make sure it’s not someone making and selling a square foot product and using the name without authorization or permission. One quick comment on drip irrigation systems, they are wonderful, convenient, and do a good job with only one caution. They take twice as much water even if used in a square foot garden compared to our recommended bucket and cup method. I think of it as bringing all the kids in, setting them down, connect them to a hose for dinner and you just turn on the valve and everyone gets the exactly the same amount…regardless of their size and thirst. But it certainly is very convenient. Thanks for your letter and notice. We’ll check it out and let you know what we find. As you can probably guess, since the name SFG is copy written and trademarked, no one can make a product using the name and method without permission.